Sign up for Broadjam today to follow AudioDyne, and be notified when they upload new stuff or update their news! 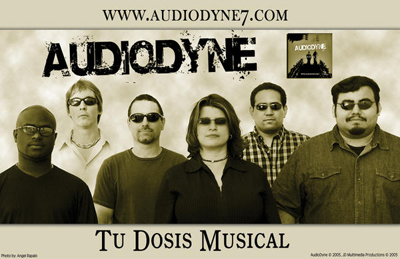 Early in 2003 AudioDyne born in the heart of Jorge Iraheta Jr. And Dina SR which have in common the belief that the Christian life is a joy that needs to be shared with others especially if is thru the music which both love?. They never wanted to be only 2 great friends working together, they wanted to be a band and it came to happen, finally, their wish come thru when Kevin Voigt (bass) Markus Rosa (drums) Rene S?nchez (percussions) y Sherwood Davis (piano) joined the band, each one of them a brother and a friend? each one with different background and different nationalities puts a blend of multicultural flavor to the growth of the music and lyrics. AudioDyne is not just another band is a band with the desire of touch the very own heart of God but to give this generation a musical doses that will bring them hope and joy.